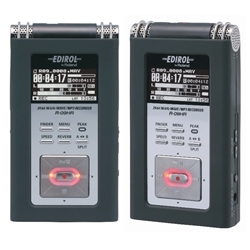 The R-09HR is a professional, high-resolution recorder that travels light and performs like a heavyweight. With crystal-clear, 24/96 fidelity, plus analog limiting, remote control, and a handy preview speaker, the R-09HR is the flagship of Roland’s award-winning R-series recorders. Thanks to its rubberized body, the R-09HR fits snugly and comfortably in hand, while minimizing handling noise. Designed entirely to let you record live sound easily at high quality, the R-09HR is a portable dream. Experience precise audio clarity with a wider dynamic range when using the higher bit and sample rates that the R-09HR offers. The R-09HR supports up to 24-bit/96kHz linear PCM recording, which has over twice the digital audio resolution of a standard audio CD. I.A.R.C. (Isolated Adaptive Recording Circuit) is a newly developed, dedicated analog circuit optimized for recording with the R-09HR’s onboard A/D converter. Electrolytic capacitors provide stable, reliable power with an independent power source for the analog circuitry, and another power source for the digital circuit board, thus eliminating DC interference between components in the R-09HR. The I.A.R.C. also contributes to high-quality, low-noise MP3 recording with the R-09HR. Small enough to fit in a shirt pocket, the R-09HR has a new tactile feel that is easy to grip. It also has a user-friendly graphic display for easy operation. The large 1.5" OLED (Organic Light-Emitting Diode) display provides a wide view with easy-to-see level meters, peak indicators, and additional recording. Without headphones, you can easily audition the recorded sounds immediately after recording, thanks to the preview speaker on rear panel. With the included wireless remote controller, transport functions such as recording start/playback start, fast forward, rewind, volume control, and input level control can be accessed from a distance. This allows the R-09HR to be placed in exactly the right position for recording, and allows for quick and easy hands-free operation. The R-09HR can connect to computers via USB for importing/exporting audio files. It supports Hi-Speed USB (USB 2.0) mass storage so file transfers are quick and convenient. Included with the R-09HR is Cakewalk’s Pyro Audio Creator LE software — perfect for WAV/MP3 audio file editing. Trim, cut, or fade audio sections, burn audio collections to CD, publish a webpage with sounds, publish a blog with audio, podcast an interview or performance, and so on. With pyro, the R-09HR package becomes a complete recording solution suite, from recording to CD-burning.